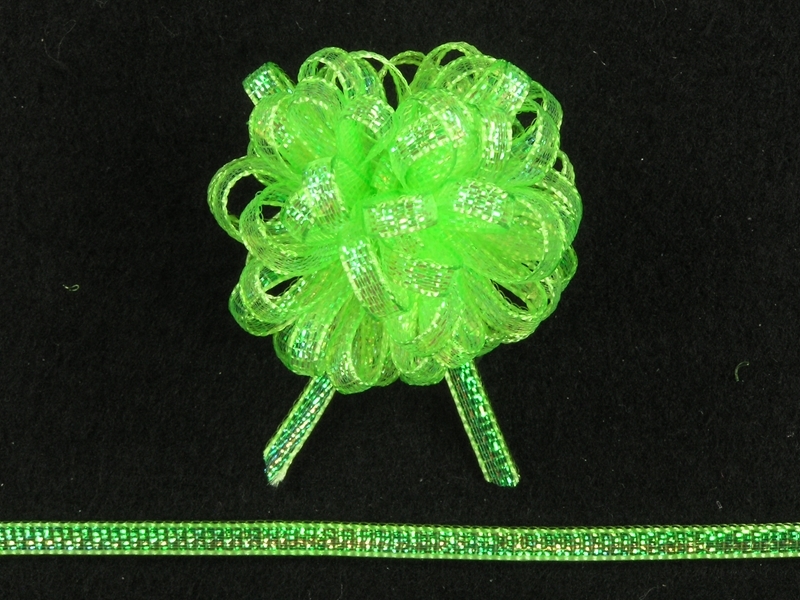 DESCRIPTION – ERPU-0108 Apple Green - Apple Green Iridescent Pull Bow Ribbon, 1/8 Inch x 50 Yards. 100% Nylon. Use this ribbon to get a perfect bow every time. Just pull the string and you've made a flawless bow. You get 15 - 17 loops out of a yard of ribbon and the more ribbon you use the fuller the bow. This ribbon will make a 1.75 - 2 inch diameter bow. DESCRIPTION – ERPU-0108 Black - Black Iridescent Pull Bow Ribbon, 1/8 Inch x 50 Yards. 100% Nylon. Use this ribbon to get a perfect bow every time. Just pull the string and you've made a flawless bow. You get 15 - 17 loops out of a yard of ribbon and the more ribbon you use the fuller the bow. This ribbon will make a 1.75 - 2 inch diameter bow. DESCRIPTION – ERPU-0108 Ivory - Ivory Iridescent Pull Bow Ribbon, 1/8 Inch x 50 Yards. 100% Nylon. Use this ribbon to get a perfect bow every time. Just pull the string and you've made a flawless bow. You get 15 - 17 loops out of a yard of ribbon and the more ribbon you use the fuller the bow. This ribbon will make a 1.75 - 2 inch diameter bow. DESCRIPTION – ERPU-0108 Lavender - Lavender Iridescent Pull Bow Ribbon, 1/8 Inch x 50 Yards. 100% Nylon. Use this ribbon to get a perfect bow every time. Just pull the string and you've made a flawless bow. You get 15 - 17 loops out of a yard of ribbon and the more ribbon you use the fuller the bow. This ribbon will make a 1.75 - 2 inch diameter bow. DESCRIPTION – 9945 Lt. Blue - Lt. Blue Iridescent Pull Bow Ribbon, 1/8 Inch x 50 Yards. 40% Nylon 60% Metallic. Use this ribbon to get a perfect bow every time. Just pull the string and you've made a flawless bow. You get 13 - 16 loops out of a yard of ribbon and the more ribbon you use the fuller the bow. This ribbon will make a 2 - 2.5 inch diameter bow. DESCRIPTION – ERPU-0108 Lt. Blue - Lt. Blue Iridescent Pull Bow Ribbon, 1/8 Inch x 50 Yards. 100% Nylon. Use this ribbon to get a perfect bow every time. Just pull the string and you've made a flawless bow. You get 15 - 17 loops out of a yard of ribbon and the more ribbon you use the fuller the bow. This ribbon will make a 1.75 - 2 inch diameter bow. DESCRIPTION – 9945 Lt. Pink - Lt. Pink Iridescent Pull Bow Ribbon, 1/8 Inch x 50 Yards. 40% Nylon 60% Metallic. Use this ribbon to get a perfect bow every time. Just pull the string and you've made a flawless bow. You get 13 - 16 loops out of a yard of ribbon and the more ribbon you use the fuller the bow. This ribbon will make a 2 - 2.5 inch diameter bow. DESCRIPTION – ERPU-0108 Metallic Gold - Metallic Gold Iridescent Pull Bow Ribbon, 1/8 Inch x 50 Yards. 100% Nylon. Use this ribbon to get a perfect bow every time. Just pull the string and you've made a flawless bow. You get 15 - 17 loops out of a yard of ribbon and the more ribbon you use the fuller the bow. This ribbon will make a 1.75 - 2 inch diameter bow. DESCRIPTION – ERPU-0108 Orange - Orange Iridescent Pull Bow Ribbon, 1/8 Inch x 50 Yards. 100% Nylon. Use this ribbon to get a perfect bow every time. Just pull the string and you've made a flawless bow. You get 15 - 17 loops out of a yard of ribbon and the more ribbon you use the fuller the bow. This ribbon will make a 1.75 - 2 inch diameter bow. DESCRIPTION – ERPU-0108 Peach - Peach Iridescent Pull Bow Ribbon, 1/8 Inch x 50 Yards. 100% Nylon. Use this ribbon to get a perfect bow every time. Just pull the string and you've made a flawless bow. You get 15 - 17 loops out of a yard of ribbon and the more ribbon you use the fuller the bow. This ribbon will make a 1.75 - 2 inch diameter bow. DESCRIPTION – ERPU-0108 Pink - Pink Iridescent Pull Bow Ribbon, 1/8 Inch x 50 Yards. 100% Nylon. Use this ribbon to get a perfect bow every time. Just pull the string and you've made a flawless bow. You get 15 - 17 loops out of a yard of ribbon and the more ribbon you use the fuller the bow. This ribbon will make a 1.75 - 2 inch diameter bow. DESCRIPTION – ERPU-0108 Silver - Silver Iridescent Pull Bow Ribbon, 1/8 Inch x 50 Yards. 100% Nylon. Use this ribbon to get a perfect bow every time. Just pull the string and you've made a flawless bow. You get 15 - 17 loops out of a yard of ribbon and the more ribbon you use the fuller the bow. This ribbon will make a 1.75 - 2 inch diameter bow. DESCRIPTION – ERPU-0108 Turquoise - Turquoise Iridescent Pull Bow Ribbon, 1/8 Inch x 50 Yards. 100% Nylon. Use this ribbon to get a perfect bow every time. Just pull the string and you've made a flawless bow. You get 15 - 17 loops out of a yard of ribbon and the more ribbon you use the fuller the bow. This ribbon will make a 1.75 - 2 inch diameter bow. DESCRIPTION – ERPU-0108 Wine - Wine Iridescent Pull Bow Ribbon, 1/8 Inch x 50 Yards. 100% Nylon. Use this ribbon to get a perfect bow every time. Just pull the string and you've made a flawless bow. You get 15 - 17 loops out of a yard of ribbon and the more ribbon you use the fuller the bow. This ribbon will make a 1.75 - 2 inch diameter bow.